The strength of intact rock is, together with the rock mass structure, probably the most important properties for rock engineering. To accurately estimate the Mohr–Coulomb (MC) strength parameters—cohesion c and angle of friction ϕ—of a rock, triaxial tests must be carried out at different stress levels so that a failure envelope can be obtained to be linearized. However, this involves a higher budget and time requirements that are often not available at the early stages of a project; thus faster and cheaper indirect methods have been developed as an alternative. 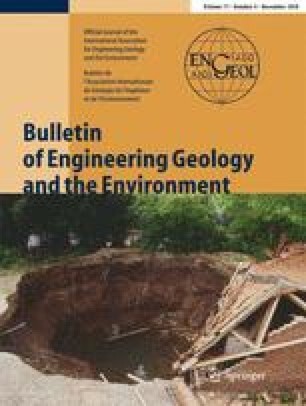 In this paper, we use genetic programming (GP) to develop a predictive model to estimate the MC shear strength parameters of intact sandstone using other strength measures (the uniaxial compressive strength, UCS, and uniaxial tensile strength, UTS) under different stress conditions which shear failure takes place. The reliability of the proposed GP model is evaluated and compared with alternative linear regression models based on UCS or UTS only, and with the traditional triaxial-based approach. Results show that, although the triaxial method provides the better estimations, the proposed GP model has the best prediction performance in the absence of triaxial data, so that it can be used for practical strength estimations for intact sandstone at the early stage of projects or when triaxial test data are not available. This research is supported by the Scientific Research Foundation of State Key Laboratory of Coal Mine Disaster Dynamics and Control (No. 2011DA105287-FW201209) and the National Natural Science Foundation of China (No. 51504218).